Ejor, Mbok, Biko, Please, All the other languages……GO & WATCH THIS FILM!!! 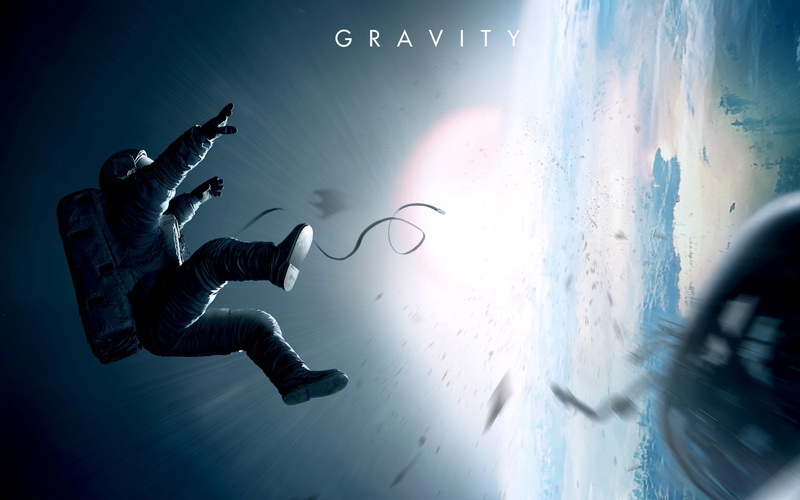 In an era where film makers are getting lazy, where everyone just wants to follow some formula, create some film & expect stupendous returns, GRAVITY is a breath of NEW AIR! This movie was an absolutely, amazing, exhiliarating thrill of a film to watch….. When I had given up on being wowed by a movie in 2013, Gravity comes to the rescue. Character Development: Things started happening really fast. Before we got to really know/connect with the characters too many WOWing things started happening and all the points where they wanted us to connect with the characters were not very effective which made the film not as heartfelt as it could have been. A more compelling plot…. I realize Sandra Bullock’s past experience was paramount in the story but it was over shadowed also by the sheer awesomeness of what was happening on the screen. Length…. It almost felt like the film makers were so busy showing off with the film that they didn’t think adding more of a story was important. I believe if this movie was longer, it could have been paced differently, and maybe A & B above could have been avoided. Apart from the above listed, any lover of good film making would love Gravity as it takes the crown for best film making of 2013 so far in my books. P.S: THIS IS NOT A FEEL GOOD FILM!!!!!! It is not a film with all the formula people have got so used to in films these days. It is a creation! So don’t expect to like it if that’s what you’re expecting. If you don’t believe me, ask the young ladies behind me in the cinema who declared they had made the worst mistake of their night choosing to watch the same movie I was thoroughly enjoying. I was a bit tempted to tell them to go home and watch Africa Magic, but I’m too nice for that *wink*. Okay, so here’s why you almost got your review a 100% right: first — without even going into what and what the father-son screenwriting duo aimed to accomplish — this is a set-in-space movie about a devastated, inexperienced woman astronaut. What then should you expect to feel, if not emotions similar to vacuum, darkness, weightlessness, escapism, and, as a matter of paradox, occasional awe? Have this in mind as I challenge your notion of (the lack of sufficient) character development in Gravity. So you remember our little friend, Escapism? Yeah, that’s the little guy that’s keeping you from knowing too much about Ryan, our protagonist. I mean, if she’s trying to get away from her life on earth, and the story is coming from her point of view, then why do you want to know more than you’re already given? (Okay, you likely don’t agree, as seen from your review above. But as a budding screenwriter myself, here’s a question I pose to you: “Has the story lost any, even a little, of its essence by holding back some backstory?” Agreed, you explain how this issue, in your view, invariably hampers the plot development as well. Good point. But to that, I’ll refer you back to that other little friend of ours, Vacuum. Oh yeah, it appears you’re gonna have to fill in the blanks, doesn’t it? Hehe, sure it does. Lastly, your argument is that of duration. Two counter-arguments from me. One, this movie is filled with several single shots that each span a whopping number of seconds. If you know film-making, then you know the director in question wants to avoid making a Lord of the Rings-type flick. Long story short: audiences will get bored, ticket sales will deep, critics will be furious, (Sandra Bullock will consider a career in housewifery) and then, of course, the movie won’t be the rave it has come to be. Number two, the reason for shooting those long, seamless shots you wanted to die for is apparent in the decision to capture the feeling of being in space. Of course, it’s also a thriller, a survival story, so all of that adrenaline-pumping action is understatedly what sustains its brilliantly-executed portrayal of real time. Finally, if the ability to portray the level of self-denial, fear, desperation, relinquishment, and longing that Bullock does, within an entirely computer-generated universe, isn’t but a rare, occasional awe, what is? Wow! Your comment deserves a post of its own…. and you do point out some very relevant facts. I understand where the film maker is coming from and I appreciate it; in fact I don’t just appreciate it, I admire it. What I’m trying to point out is the lack of patience the majority of current audiences may have with movies like the masterpiece we are talking about. In the era where people want you to do all but spell out the names of your characters in the script of your movie, Gravity takes them beyond thinking about the character’s back story to attaching phylosophical perceptions to her situation. This may give the critics exactly what they are looking for and word of mouth would definitely carry the audiences to the cinema, but I still feel the story could have hit more cords in the heart. You do agree that more people would notice/remember those shots ‘we wanted to die for’ way more than they would remember what the story was really about. P.S: I just may be like those school teachers looking for a reason to hold on to that last one mark, but it does not take away from the fact that I was sorely tempted to watch the movie a second time over the weekend but eventually opted for Captain Philips. Gravity is just ‘WOW’.